I love books: always have, always will. From grade school days of devouring Babysitter's Club and Sweet Valley Twins paperbacks to getting caught with a flashlight and book under my pillow to working in book publishing and being surrounded daily by bound words on pages, the love affair has lasted and there's no end in sight. A wonderful English professor and friend from Rutgers gave me this lovely copy of Mrs. Dalloway. I had a hard time finding the cover image to show you all. 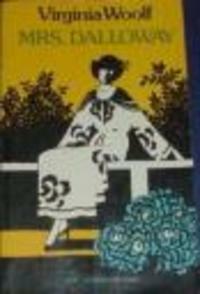 A more recent cover displays a modern-looking scene with a woman in floppy hat and flowy dress -- no doubt embodying Mrs. Dalloway herself, but this cover seems much more appropriate to me. The other looks too casual, lighthearted, and capricious, while this geometric, almost stark imagery seems to be better suited to the story. Anyway, I'm sure you're more interested in what I've cooked for our little book club tomorrow. 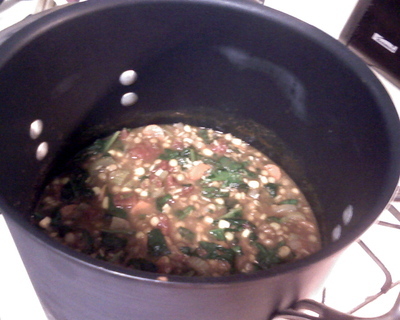 I made a huge pot of Tomato-Lentil-Vegetable Soup adapted from At Home with Magnolia by Alyssa Torrey, once owner of Magnolia Bakery in NYC. (Full disclosure: the publishing company I work for published this book.) I have thoroughly enjoyed this pretty little cookbook and have found more than a few recipes entirely satisfying. This soup is no exception. Chock full of fresh veggies and plenty of plump green lentils and brown rice, I don't think anyone will be leaving my apartment hungry tomorrow evening. In my gigantor Calphalon stockpot (thank you, Jen and Joel! ), we have onions, garlic, carrots, celery, spinach, corn, tomatoes, veg stock, lentils, brown rice, cumin, salt, and pepper -- as I said, loads of veggies and lots of flavor! 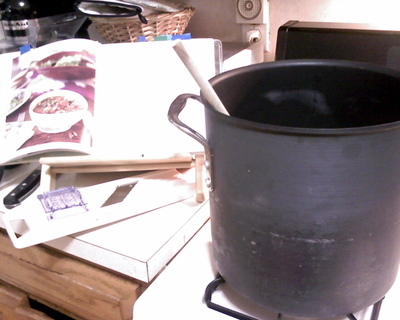 Here's my adored pot and you can also see my brand new, beloved mandolin. A great purchase. It was invaluable in making homemade potato chips and onion dip on Oscar night, but more on that another time.